Each Warrior who has killed a lion himself is allowed to wear his headdress during the ceremony. 1967/68 Kenya, East Africa. Platinum/Silver Collection. “The Maasai are pastoral semi-nomadic people who inhibit the open grasslands and dry forests of the great rift valley of kenya and northern tanzania. Primarily a cattle keeping people, they live mainly off the milk, meat and blood of their livestock. Among all the tribes of east africa their murran (warriors) are the most renowned for their bravery. 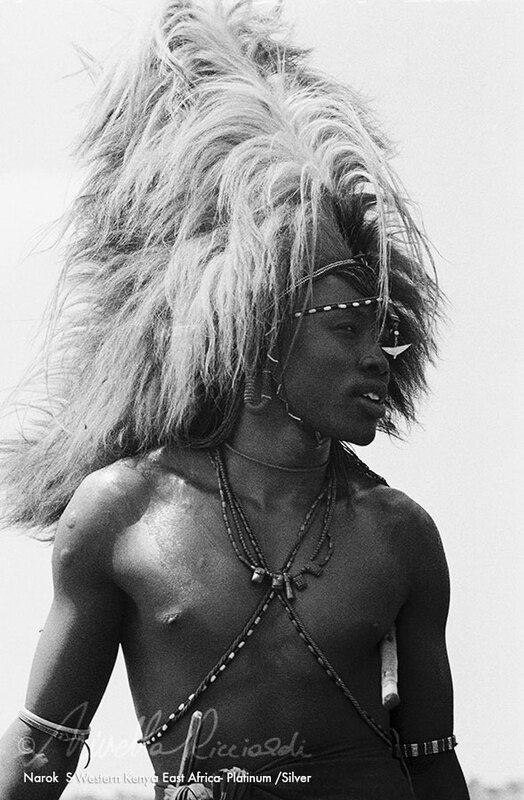 Shortly after puberty,their young men undergo a tribal initiation ceremony, involving circumcision and thereafter become murran, for a period of 10 to 12 years . At the end of this period they take part in the eunoto ceremony after which they cease to be regarded as warriors are allowed to marry and have children. They become fully tribal elders”.